Diggers Valley: 6 December 2008. The week beginning the 6th of December 2008.
for anyone on a connection slower than mine. Please let me know if it does. Since Stephan tried to cut his finger off, guess who has to milk the cow. I had anticipated taking over this task from the middle of the week when Stephan goes away, but NOT YET! Faded Mary Putangitangi. 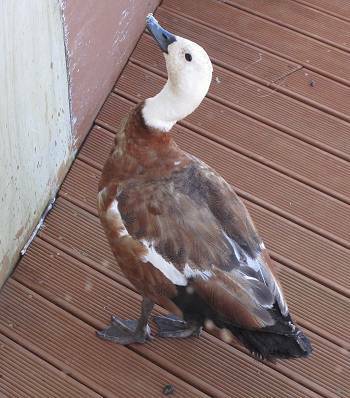 She's behaving very oddly - at the moment I took the picture she had just fallen off the power meter box on the side of the house and was about to fly up onto the roof. She's very unsettled. Porky and Porky. 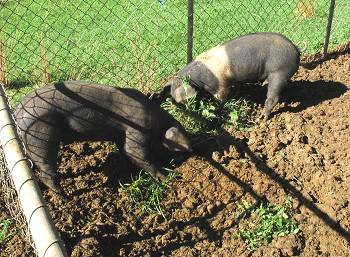 As predicted, they turned over every last bit of ground in their pen and it's all horribly brown and muddy. 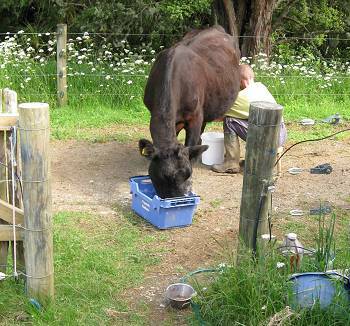 Stephan takes them green things which he weeds from the vegetable garden and anywhere else he finds likely-looking forage. 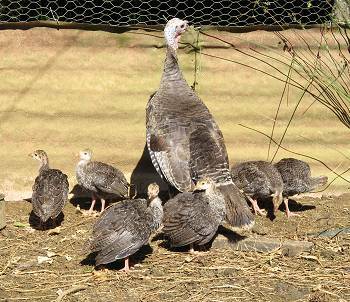 The turkey chicks are growing steadily. I'm no longer sure how many there are. 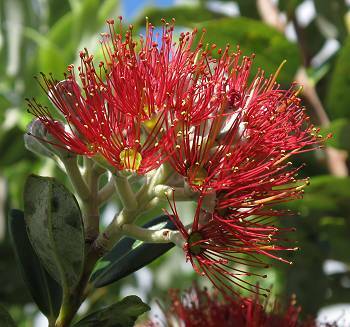 I like Pohutukawa flowers a great deal. They say it's summer! 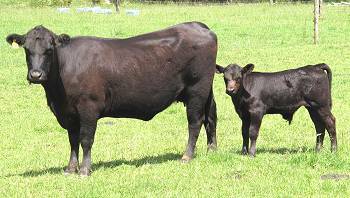 525 and her calf. Some long time ago I took a similar picture of 525's mother, 99, and 525's elder sister 421. 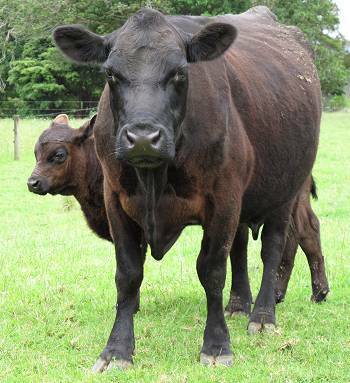 421 turned out to be a very unimpressive mother - did her job well enough, but both of her calves' growth rates were well below the herd's average at the time and I culled her from the herd. 525 is a lovely little heifer, but her calf isn't doing as well as I'd like him to and she's carrying more condition than the other first-time mothers. I went for a walk to check cattle and took the plonker with me. 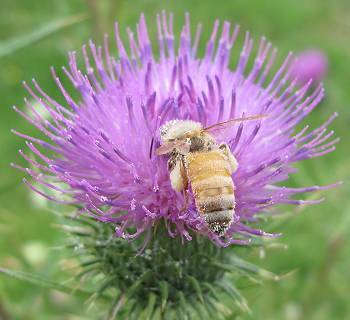 Then I gave it to Stephan to hunt ragwort plants. I discovered the manual focus setting on my camera while out walking, so I started playing with it. What a cool camera! 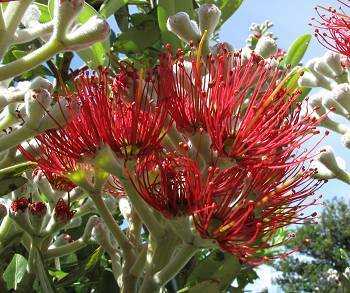 Flax flowers and below, more of the lovely Pohutukawa. 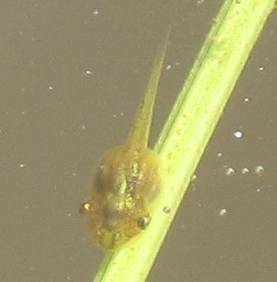 We have been hearing frogs in our pond for ages, but the tadpoles are surprisingly elusive. I was trying to take pictures of dragon flies this afternoon, so had been sitting quietly on the edge for sometime and noticed this little tadpole appear at the water's edge. 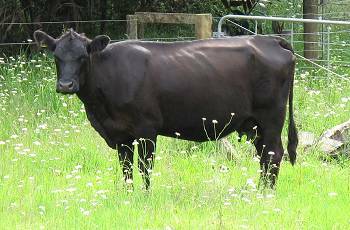 We went right out to the Back Barn paddock this evening, hunting ragwort, checking cattle. 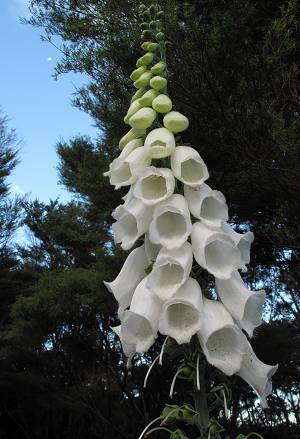 There are a few white foxglove plants around every year, as well as the occasional light pink one. They're not a weed we're particularly concerned about because they tend to grow only in marginal areas during part of the year and the cattle won't eat them anyway. Jill, being English, thinks they're lovely. 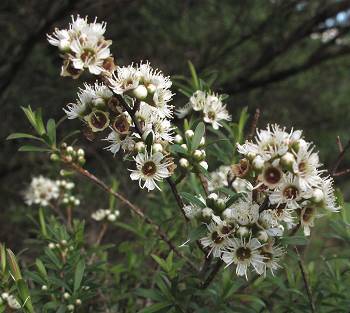 This is Kanuka, Kunzea ericoides. 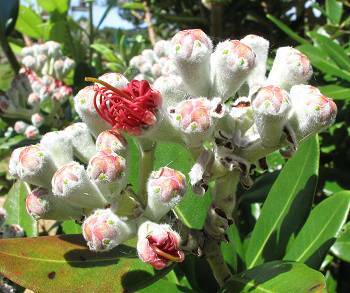 They are prettily in flower all over the place - it is Kanuka which clads most of our scrub-covered slopes. 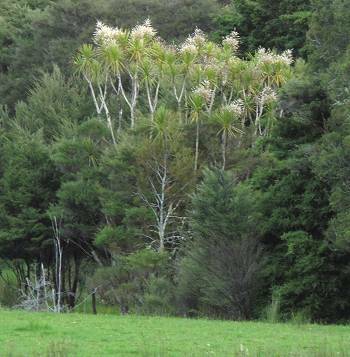 On our way home, while Stephan hunted more ragwort in the fading light, I saw the Cabbage Tree in the small Frog swamp area was in full flower. 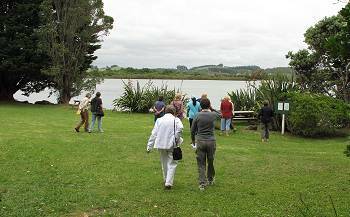 Today was a Women in Ag meeting day, held at Aroha Island in the Kerikeri Inlet in the Bay of Islands. 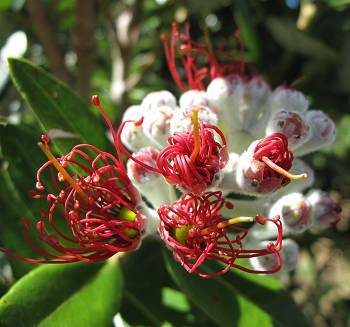 Aroha Island is now under an Open Space Covenant administered by the QEII National Trust and the island is managed by a local community trust. 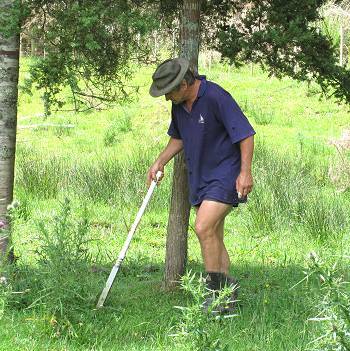 It has a resident pair of Kiwi, which are currently nesting and which we were naturally not permitted to disturb. 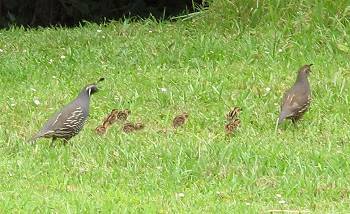 California Quail with their tiny offspring, which can move surprisingly quickly across the grass. 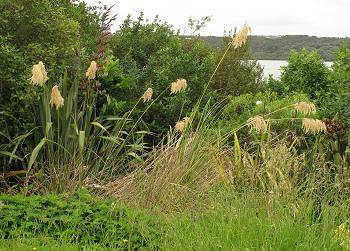 Toetoe - the real native one, not the introduced pampas, which flowers in the autumn. 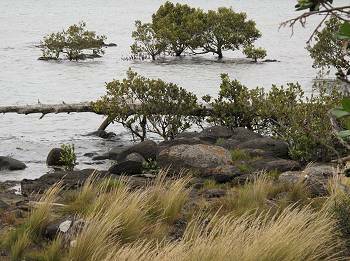 Mangroves grow on the edge of the water. Some people hate Mangroves, but for me they've always been part of home, because they were present in many of the areas we sailed to on the boat when I was a child, including this inlet. There's a story of me as a very small child asking what a mangrove fruit was and then asking if a little man grew out of it? Mangrove fruit and seedlings float around in the sea and were often in the water where we swam at Taipa while the family was at Yacht Club on Sundays. 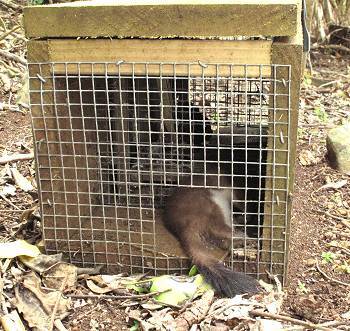 This must be both a satisfying and a worrying catch: a stoat in a DOC200 trap. Stephan has been catching one or two on his trapping runs as well. It must be their active time of year. I've meant to stop and have a look at this tree since I noticed it last year: a Puriri which appears also to have a Totara growing in it. It's not very distinct in the picture, but the dark green growth in the middle of the Puriri is the foliage of a Totara. 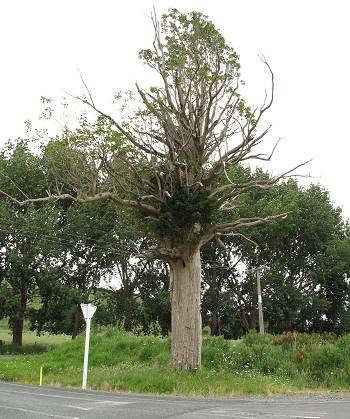 It is of a reasonable size and appears very healthy, so it must presumably have rooted down the middle of the Puriri and either be acquiring enough nutrients from the Puriri's dead centre, or have rooted right down to the ground. We spent several hours in town today, one of the purposes of our visit was to see a nurse at the surgery, to have Stephan's finger checked. It has become slightly infected, so he's now taking antibiotics. I took pictures, of course. Several months ago we were invited to a wedding. Stephan's sister Rachel's son David, is marrying Kelly. 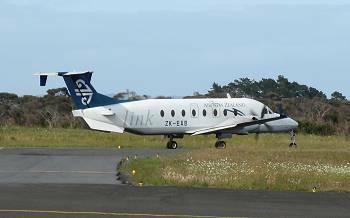 Their choice of wedding date unfortunately meant that we couldn't both go, so I booked an air ticket online, return to Christchurch for $300, for Stephan, and today we went up to the airport and he flew away for a week. It has surprised me over the last couple of years how many young people are choosing to be married rather than opting for the new Civil Union. I'm also astonished at the number of young women who then choose to change their names to those of their husbands. Feminism has finished its work? I don't think so! Personally speaking, I'd never give up a name I can spell forwards or backwards. I got on with things early this morning. 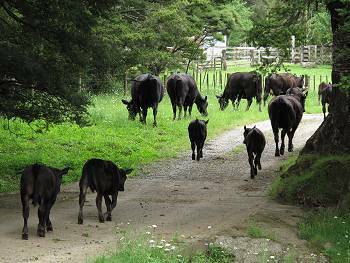 First I brought the young mob of cattle to the yards and gave them all a copper injection - I weighed and drenched most of them yesterday afternoon. There not being anyone handy to help me put them across the road, I took a chance and did it alone and they all went very quietly where they were supposed to. Otherwise they'd have been waiting around in my way all day until Jane, our neighbour, came home from town. 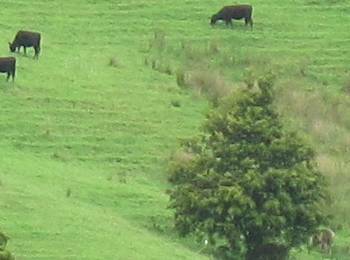 By the end of the day I'd also coppered all the cows with calves, leaving only the empty cows and the bulls yet to do. I was pretty tired and decided it would be best to wait until I was fresh before dealing with the bulls. 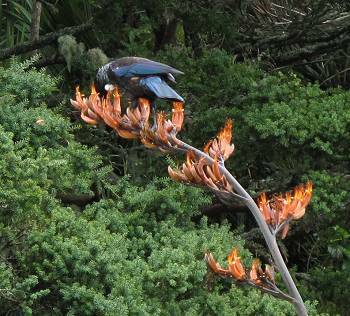 A Tui having a nectar snack outside our house. This is the best photo I've been able to get so far - I stuck the camera through a gap in the window which I'd left open for the purpose, so I wouldn't disturb the bird as it fed. Imagen, still light in condition, but looking rather better than she did. Spice, the cat I rescued as a tiny kitten almost four years ago. 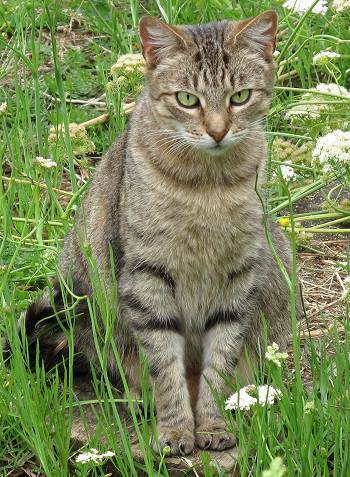 She likes to follow whenever we walk down around the native planting area and yowls loudly when she loses sight of us in the long grass. Sometimes she's surprisingly sociable. 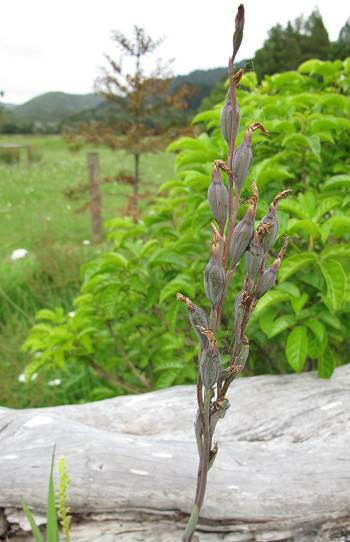 After posting the pictures of the delightful orchid I discovered in November, I received some interesting correspondence from some members of the New Zealand Native Orchids Group. 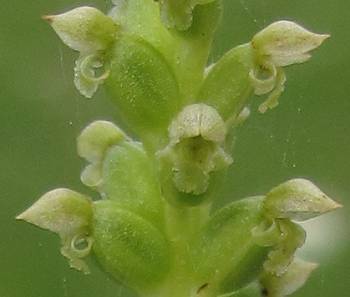 The orchid may be one not often seen, and first described one hundred years or so ago by a member of my Godfather's family. 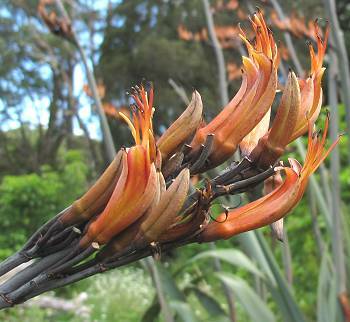 If the plant should flower again next year, I am to call and invite a visit from those who are expert in such flora. I have been told it is probably Thelymitra pulchella "sansfimbria". 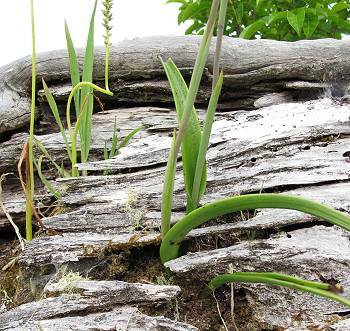 Below is the Onion Orchid, still in flower, growing next to the Sun Orchid plant. The base of the Thelymitra on the right. 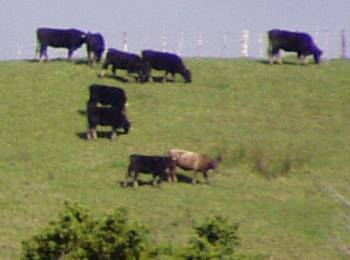 Counting cattle on the hill over the road with the new camera's lesser zoom factor but greater number of pixels, is just as easy as before. These pictures are taken from as near to the same place as I could find to illustrate the difference, with the new camera's view on the left. The visibility of the grey/brown animal in the bottom right hand corner is pleasing, because that colour quite easily blends into the green when I try to see them from afar with my eyes alone.